The WI DATCP Wisconsin Pest Bulletin reported August 4th the phenology model for Western Bean Cutworm moth emergence suggests that 75% of the moth flight is complete as far north as Stevens Point in Portage County. Pheromone trap and black light trap counts have begun to decline across the southern half of the state. By contrast, emergence is only 50% complete in the north-central and northeastern counties where peak flight is underway. The purpose of this short post on western bean cutworm is to remind field and processing sweet corn growers in north central and northeastern counties that peak egg-laying is underway. Now is not the time to wrap up scouting for egg masses and small larvae in those areas. Another couple of weeks of scouting will help to make sure that you detect egg masses and small larvae, determine treatment thresholds, and treat if needed before larvae enter the ear. Bill Schaumberg, CCA, Polenske Agronomic Consulting, confirmed this with his field observations this week. Field corn in his acreage in northeastern WI in and around Outagamie Co. is ranging from pre-tassel/very early tassel to tasseled and pollinated. One of Bill’s grower client western bean cutworm pheromone traps was catching ~5 moths per week, and increased in that particular trap to 40 moths for last week. This indicates peak moth emergence is occurring. Female moths prefer to lay eggs on pre-tassel corn, but they will lay eggs on post tassel corn, particularly toward the end of the moth flight when there is less pre-tassel corn available. However, treatment decisions are best based upon percentage infestation with egg masses and small larvae. Peak egg-laying occurs during peak moth flight. 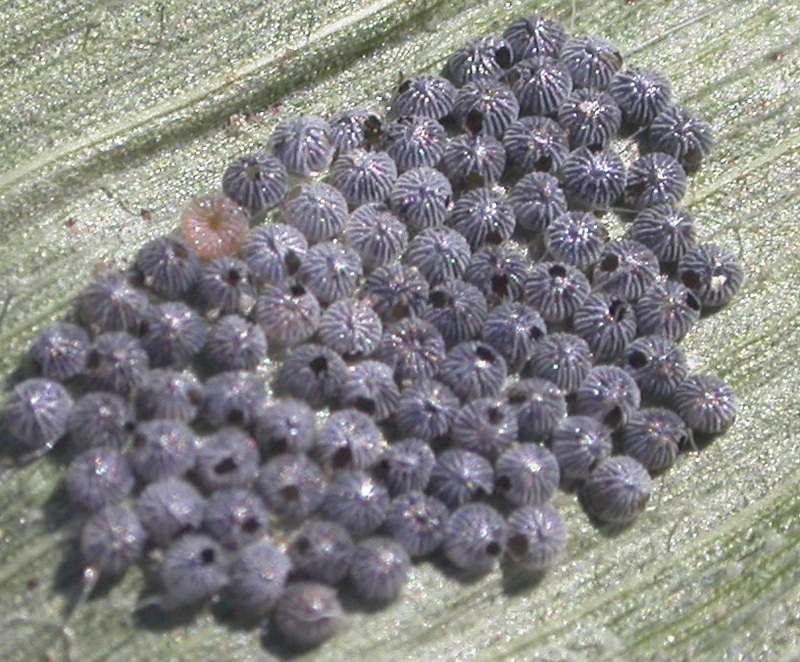 Please refer to the July 21, 2011 WCM article Western Bean Cutworm Egg Masses and Larval Hatch – Scout Field and Processing Sweet Corn for information previously published in this newsletter. After peak moth emergence (the stage reached in the southern half of the state), you are more likely to find small larvae on leaves, in leaf axils, and on the silks after they have dispersed from the egg mass. Small larvae on the move on the plant are more difficult to detect. During peak moth emergence as is occuring in north central and northeastern Wisconsin now, you should detect more egg masses relative to hatched egg masses. Eggs turn purple approximately 2 days before hatching. Treatment threshold for field corn is 5% infestation (5 of 100 plants sampled with egg mass and/or small larvae). In processing sweet corn, the threshold is 4% infestation. Early instar western bean cutworm larvae on corn silks (harder to scout for in the field relative to egg mass scouting during peak moth flight). Photo: E. Cullen, UW-Extension (2010).